Economist Michael Hudson by way of Naked Capitalism points out social security has it's own funds source. You know that the debt kerfuffle is as staged as melodramatically as a World Wrestling Federation exhibition when Mr. Obama makes the blatantly empty threat that if Congress does not “tackle the tough challenges of entitlement and tax reform,” there won’t be money to pay Social Security checks next month. In his debt speech last night (July 25), he threatened that if “we default, we would not have enough money to pay all of our bills – bills that include monthly Social Security checks, veterans’ benefits, and the government contracts we’ve signed with thousands of businesses. Krugman also blasts the absolutely inane press, who try to claim this extremism, also coming from Obama is centrist or partisan. Not on your life, this is the war between the crazies and the slightly less crazies, all agendas that will crucify the U.S. economy. 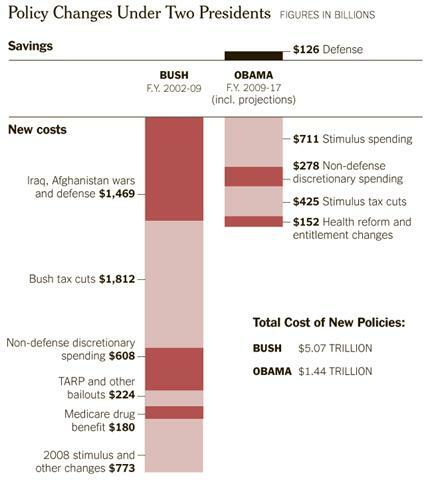 Econbrowser amplifies the causes of the debt, with war and the Bush tax cuts coming out on top. Not that it matters, facts, reality do not enter into this hostage taking psychodrama being played out in prime time. As far as 2021 is concerned, the solution seems pretty simple. Let the tax cuts expire at the end of 2021. Assuming that we do patch the AMT, killing the tax cuts is worth $444 billion in 2021, or 1.9 percent of GDP. That would cover almost two-thirds of the total deficit. Of course now 9 out of 10 Economists say the United States credit rating will be downgraded and this warning is repeated like a mantra of the Flagellants. What do the American people think? No surprise there, new polls are pouring in with the message of doom, A Pox on Both Houses. Anyone with a little mathematical skill, seemingly devoid in Congress, can balance the budget in 5 minutes by rolling back the Bush tax cuts and other modifications. No cuts to Social Security or Medicare involved. Deal with the trade deficit and flash trading on Wall Street, Kaboom, one gets a surplus in no time. So how crazy are the Tea Party Republicans? It's so bad, they won't even pass House Speaker Boehner's plan. What frightens this writer the most is thinking through history. During the last great economic crisis, the Great Depression, the United States got FDR, while Germany got Hitler. It seems the disgust with the Wall Street and Bank Bail Outs, plus corporate lobbyist generated Health care reform and a Stimulus that did not require employers to hire American or Buy American had great blow back. Unfortunately that blow back is taking America into the fire from the frying pan. Either way, having representation that represents the national interest seems impossible and now, having a government that isn't a global joke seems to have gone the way of the American Dream.